A portable degas system that can be tailored to customer requirements with a choice of vacuum pumps, gauges, chamber sizes, feed-throughs, and more has been introduced by MV Products of North Billerica, Massachusetts. The MV 4-Gallon Portable Degas System is totally self-contained in a 20” sq. mobile cart and operates on 115V power; making it a versatile solution for small degassing, encapsulating, potting, and drying applications. 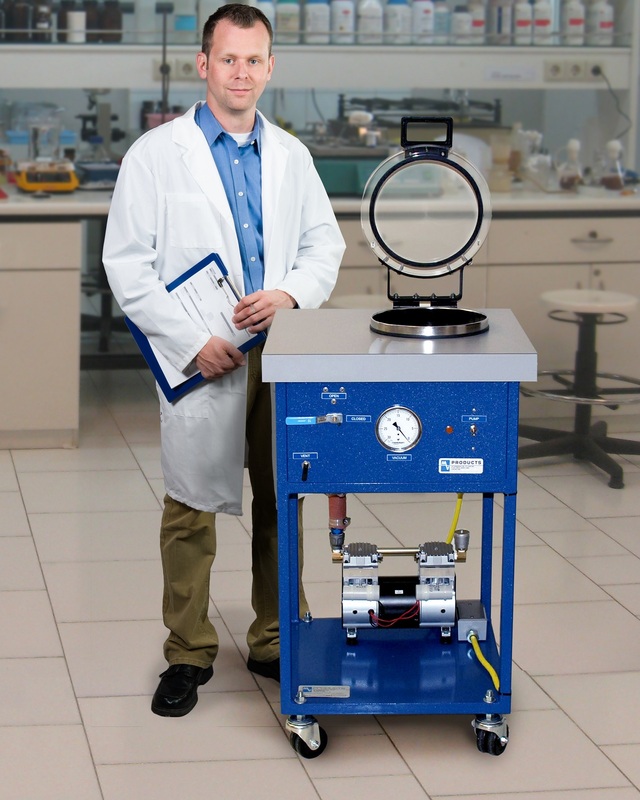 Offered with a choice of vacuum pumps to pull a 15” to 29” HG vacuum, it has a clear 1” thick Lucite® top for viewing and includes a 0-30” Hg Bourdon dial gauge, isolation- and vent-valves, a stainless steel chamber, and an on/off switch. Easy to move around a facility, the MV 4-Gallon Portable Degas System comes standard with a dry piston 5 CFM vacuum pump that pulls 29” Hg and can also be ordered with an oil-lubricated 2-stage rotary vane pump, or a dry-running scroll pump. A comparable 15-gallon system is also offered with an optional rotary motion feed-through and various other options. The MV 4-Gallon Portable Degas System is priced from $5,495.00, depending upon configuration. Price quotations are available upon request.